Girls' Club presents Offsite Performance: Nearing, an elaborate, multi-media performance from the Fort Lauderdale-based artist Jen Clay on Saturday, June 3, 2017, 6-9pm, at ArtServe, 1350 E Sunrise Blvd, in Fort Lauderdale. First seating begins promptly at 6:30, the second at 7:30pm, with an interactive prologue and intermission. Nearing is an immersive experience bringing together large scale puppets, performative sculpture, ambiguous creature-like costumes, stop motion animation and an extra-terrestrial soundscape created by Clay’s collaborator Elise Anderson. Audiences of all ages are invited to witness the origins of seemingly friendly non-human beings with unknown intentions and a very visceral obsession with the audience, in this interactive performance. Like much of Clay’s work, Nearing is inspired by the culture of mysterious creature sightings reported in rural communities, like that of West Virginia’s Moth Man and North Carolina’s Brown Mountain Lights. These mysterious phenomena have fed a subculture of paranormal believers, conspiracy theorists and generations of suspicious, imaginative people who doubt we are alone in our universe. Although the event is appropriate for all ages and takes significant influence from children’s edu-tainment tropes like Sesame Street and Teletubbies, adult themes persist. Nearing references supernatural and fantastical occurrences, re-creating very human experiences of social anxiety, fear and existential doubt. This event is free and open to the public. RSVP/registration required. VIP tickets are available and include a copy of Jen Clay's recently created artist book, published by Is Projects, which acts as a prologue to this performance and includes interactive elements, pop-open doors and pull-out tabs. Event is free. Registration RSVP required. Click here for tickets. Nearing is an artist book created by Jen Clay, screenprinted by hand with custom pop ups and fold out, during April 2017 via Existent Books. The spiral binding allows the book to stand up like a miniature stage enabling the reader to interact with the piece as a performative object as well as a book. The book consists of 18 pages with pop ups, cut outs, and fold outs. Nearing was printed in an edition of 100, all signed and numbered by the artist. Existent Books is a semi-annual publishing initiative which brings artists to IS Projects to experience fine art printmaking and letterpress printing. These artists then design an artist-book that is inspired by our collection of historical letterpress type and image cuts or new printmaking techniques learned at IS Projects. The goal of Existent Books is to encourage contemporary artists to contribute to the ongoing history of book arts while stimulating the evolution of the medium. Using a variety of media including video, installation,and performance, Jen Clay constructs narratives that investigate fear and anxiety through recreations of common horror entertainment tropes. 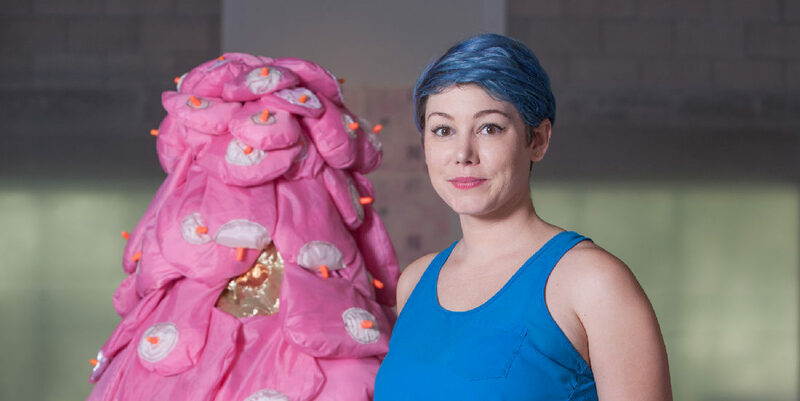 Her work is inspired by the playful aesthetic of educational children’s TV shows which can be seen in my use of stop motion animation, overly embellished costumes and puppets that speak directly to the audience. Her videos and performative work references supernatural and fantastic phenomena juxtaposed with mundane urban and natural surroundings to represent dysfunction such as trauma and abuse in familiar places, people and things. Absurdity. Surrealism. Playfulness. These qualities pop out in almost all of the work by Clay, who admits in her artist's bio that her practice "is influenced by hallucinatory experiences that manifest doubt in one's surroundings and the self." The artist, who holds an MFA from the University of Florida, invites viewers on a subversive ride through her experimental, multimedia body of work. The charming and quirky North Carolina native is inclined to juxtapose realism (sometimes using leftover food or making a nod to grotesque bodily fluids) with cutesy pop-culture elements. This both entices and throws off viewers. A jack-of-all-mediums, she sews her own costumes, paints, sculpts, and even makes stop-motion animation. Jen Clay lives and works on Fort Lauderdale. She has her MFA from the UF in Gainesville, FL and BFA from UNCC in Charlotte, NC. ArtServe is an award-winning arts incubator, one of the original six created in the U.S. with a mission ofdeveloping programs that support artists and cultural organizations as a means to creating vibrant, economically viable communities. A 501(c)(3) nonprofit organization, ArtServe offers individuals and businesses a wide range of services, events, affordable facilities and collaborative opportunities that enrich our community, strengthen our economy, foster entrepreneurship and help artists have successful, sustainable careers doing what they do best: turning their passion for the arts into their profession. In short, ArtServe helps artists and cultural organizations turn their art into business. Recognitions include the Salute to Business and Innovation Award for Arts/Culture from the Greater Fort Lauderdale Chamber of Commerce, the 2014, 2015 and 2016 Brazilian International Press Award, the Doyle Award for Non-Profit Excellence and the Nonprofit Academy Award for Best Non-Profit Arts Organization. Funding for this project was made possible in part by Funding Arts Broward, by the Broward County Board of County Commissioners as recommended by the Broward Cultural Council and private donors.